The International Monetary Fund (IMF) is closely monitoring recent events in the world's emerging markets amid concerns that the withdrawal of monetary stimulus by the US will add to the turmoil caused by the sudden slump in Argentina. 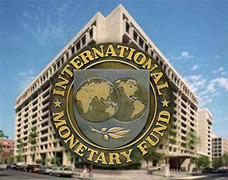 The IMF believes that the next phase of the gradual removal of stimulus to the US economy by the Federal Reserve could be the trigger for fresh turbulence in countries seen as vulnerable to capital flight, such as Turkey and Indonesia. IMF Managing Director Christine Lagarde told the World Economic Forum in Davos that the so-called tapering by the US Central Bank was a potential problem. "This is clearly a new risk on the horizon and it needs to be closely watched," Lagarde said. "How tapering takes place, at what speed, how it is communicated and what spillover effects it has, particularly in emerging markets." Markets sold off after the Argentinian peso had its biggest one-day fall since 2002. Chairman of BlackRock fund, Larry Fink, told the WEF that one of his concerns was the large positions held by investors in various emerging markets. He said that tapering was not the main problem. "It's going to require much better domestic policy in these emerging markets," Fink said. The governor of the Bank of England, Mark Carney said that stronger banks and less indebted consumers meant the UK was now in better shape, but listed an array of weaknesses that would inhibit the Bank raising interest rates. He said UK banks might need to build up their defences against further problems. "As good as the numbers have been in the last three quarters, we're talking about household-driven growth, where the economy is 20% below its pre-crisis trend level, that has not yet rebalanced and is still vulnerable to problems in its neighbour (the eurozone)." Carney indicated that the UK would impose tougher rules on its banks than those agreed internationally. "I do think home markets in several cases, including the UK, need to supplement them as appropriate." Meanwhile, the President of the European Central Bank, Mario Draghi, said he was prepared to use all possible weapons to avoid the eurozone sinking into Japanese-style deflation. Interest rates could be cut from their already low level if necessary. Draghi was speaking shortly after senior eurozone finance ministers were forced to defend the plans intended to avoid eurozone banking failures after Lord Turner, the former chairman of the Financial Services Authority, raised concerns about their effectiveness. Turner said that while a collapse of a large bank was less likely than in the past, the eurozone needed to know how to handle a bank that needs more capital after stress tests conducted this year. "You have to put in public capital and that's the resolution fund. The big danger for the eurozone over the next 10 years is that until that fund is in place you run a risk," Turner said. German Finance Minister Wolfgang Schäuble and his Dutch counterpart Jereon Dijsselbloem, who is also President of the group of eurozone Finance Ministers, insisted the European Stability Mechanism could be used to bail out banks. Following criticism that stress tests of banks in the past have not been tough enough, Dijsselbloem said he hoped that problems were uncovered. "I hope it will unveil some unpleasantness, as that will give me a good feeling that is being done properly," the Dutch Minister said. Schäuble said that he had wanted the ESM - to be £55 billion in 10 years - to be bigger and kept up the pressure for structural reform in the French and Italian economies after progress made by Spain, Ireland and Portugal. Turner exposed differences with Schäuble by making references to the way the US had tackled the banking system, forcing banks to take bailouts if they could not raise money on their own. "We are not the United States of America, we are not the United States of Europe we are the European Union, quite complicated but rather successful," Schauble said. On a panel discussing what impact technological changes were having on the workforce, a professor at Harvard, Larry Summers said, "We pay people too much not to work and not enough to work." Philip Jennings, who runs the UNI Global Union, praised the Bank of England for using unemployment as a guide for the next rate rise. "It's changed the narrative," he said.